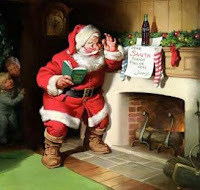 Santa Claus is a non Biblical term but came some where around mid 18th century. It is believed that the name Santa Claus originated from a name called Saint Nicholas. Their are many stories about the origin of Santa Claus. Though origin of Santa Claus is still not determined exactly as soon as December comes his pictures in many greeting cards, and decorations is very common. It is also believed that he is a fictitious character in some of the English novels. As far as I know it is said that in Turkey their was a family in which a father who was unable to do marriages of his three daughters becomes so worried. So Saint Nicholas who was a Bishop lived in their neighborhood knew their condition and used to visit their house during nights. From the window he used to drop some money which that family used to notice in the mornings. This process kept on going for few months so the father of that house determines to know how that money was dropped into their house and finds out the secret that it was Saint who was giving them money. So when Saint knew that his way of dropping money was revealed he says to the man not to tell anyone but this soon spreads. Its already chilling out here and almost Christmas. Preparation for celebrations begins from last week of November. I thought few wall papers of Santa Claus for download might help people around with changing backgrounds of their desktop and also might help in designing their e cards or greeting cards. Below is the download links of few pictures of Santa Claus. Their are 40 wallpapers which I have collected and uploaded just download and unzip them.